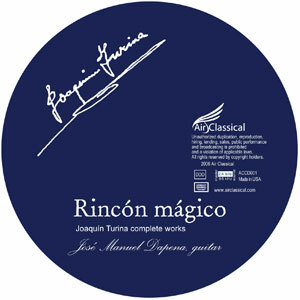 Joaquín Turina complete works / José Manuel Dapena guitar. 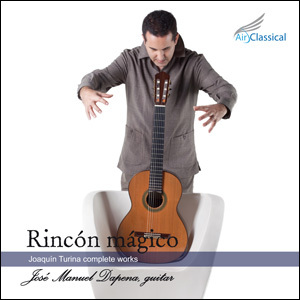 Joaquín Turina complete works on original manuscripts, José Manuel Dapena guitar. 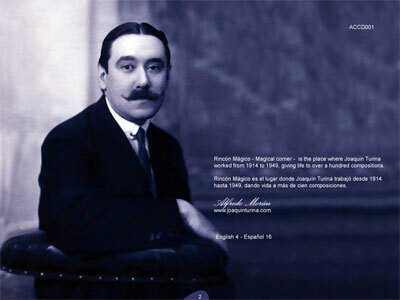 Rincón Mágico - Magical corner - is the place where Joaquin Turina worked from 1914 to 1949, giving life to over a hundred compositions. Rincón Mágico es el lugar donde Joaquín Turina trabajó desde 1914 hasta 1949, dando vida a más de cien composiciones. Recorded at Air Classical Studio “Ventoxo”, in February 2006. © 2012 Mastered for iTunes, Air Classical. You have to appreciate the new generation of guitarist who take the initiative to manufacture their own albums instead of waiting for a A&R rep to bless their efforts with a recording contract because generally, this rarely happens anyway - unless an artist happens to win a contract through a competition or else land a bulldog manager who can procure a spark from twizzling sticks against flint and from snapping at the heels of various labels while papering their client´s face all over town á la the graffiti artist Banksy. 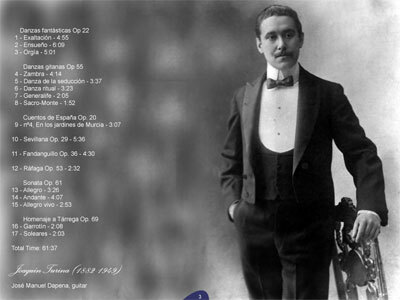 Spanish guitarist José Manuel Dapena has formed his own label, Air Classical, which issues music via downloadable mp3s. 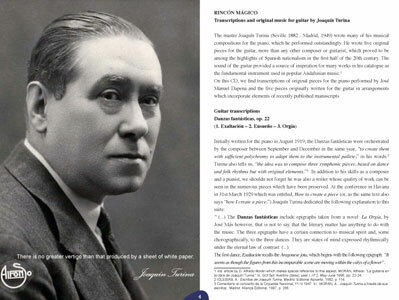 Dapena´s newest release, Rincón Mágico, features his performance of the Joaquín Turina´s entire body of original manuscripts. Given that the now-defunt Tower Records in New York was never open or accessible 24 hours the way the online web is, the idea of a click-to-pay and download album has it appeal, even it it´s lacking the shiny tactile magpie charm that a physical CD offers. Just think - seriously, where are you going to stuff another CD on your shelf anyway?. A quick google search of this album title and artist shows that the album is available online for download from various number of popular music sites, including iTunes and Amazon. 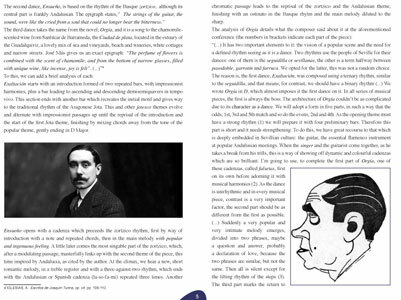 Dapena, a student of David Russell´s, also studied harmony with Turina´s grandson, José Luis Turina and he actively correspond with Alfredo Morán of the Turina archives, when working on these pieces, which showcase Turina´s contemporary, modernistic interpretation of traditional Spanish music. Dapena succeeds in fully capturing the character and spirit of these pieces, which include Turina´s Danzas fantásticas Op. 22, three pieces originally written for piano, along with Danzas gitanas Op. 55, inspired by gypsy music of Granada. Also included is a lovely rendition of Cuentos de España Op. 20, Sevillana Op. 29, Fandanguillo Op. 36 Ráfaga Op. 53, Sonata Op. 61 and Homenaje a Tárrega Op. 69.